Yesterday we wanted to find something different for breakfast after tennis. After wandering around, we stopped at a chicken and duck noodle and salad stand. We ordered one bowl of vemicelli with chicken and one noodle soup with chicken. We thought that'd be ok and cheap but the lady kept asking us about our order and confusing us. Other people in the restaurant are shaking their heads. I didn't really understand if their reaction meant that they knew her or what? 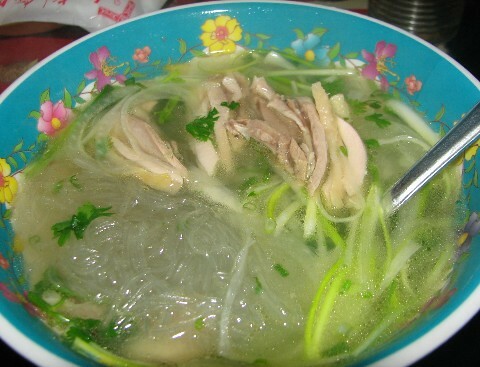 Anyway, we ended up with two bowls of vemicelli with chicken and it costs 150,000VND. I couldn't say a thing, I was so shocked. I couldn't believe my ears. I thought she's probably going to say it's New Year which is a common excuse to rip tourists off. She didn't say anything. We just had to accept her price! I told people from the hotel and they thought I was joking. This really pisses me off and this is not the first time as well. My friends invited me to have dinner at a Thai restaurant in Vincom Tower a few weeks ago. It was the weekend and it was really crowded, full of smoke and noisy. We could hardly hear our conversation unless we spoke very loud, almost shouting. We ordered chicken soup, prawn soup, mango salad, stir fried mixed vegetables, french fries, stir fried corn and finished with a hot pot. We always order too much and we couldn't finish all of the food. 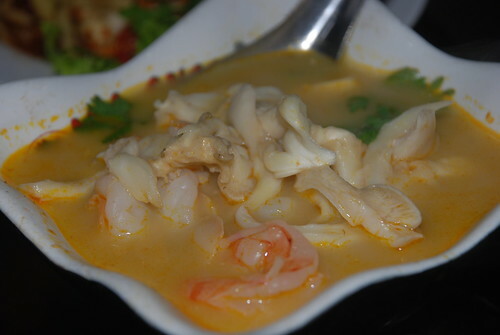 I really like the mango salad as the mango was very fresh and a bit spicy and the rest of our food wasn't too bad but they use a bit too much coconut milk in the soups. 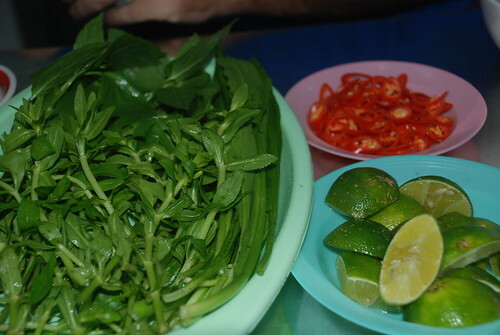 Like many Vietnamese, my friends didn't enjoy that much as they thought it was too spicy, sweet and fatty. They were right about some of that but I tried to explain to them about Thai food always being spicy. We didn't have a good time and I don't think I would recommend this restaurant to anyone as there are plenty of nice Thai restaurants in town which are not that expensive. We spent over 1.7 million dong on our meal for 5 of us which is about $95. As some of my good friends went back home during my birthday in December, I decided to celebrate instead in January. We prepared Italian winter food as the winter weather was still around but unluckily, the weather changed on the day to such a beautiful sunny and quite warm day. 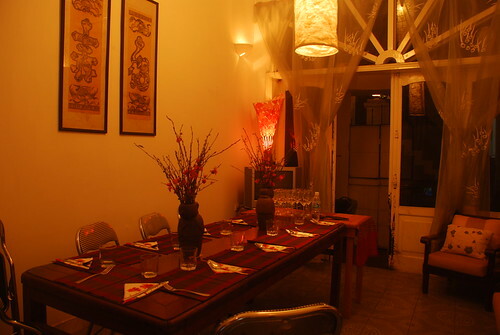 We even had to switch on the air-conditioning, which is really unusual for Hanoi at this time of the year. 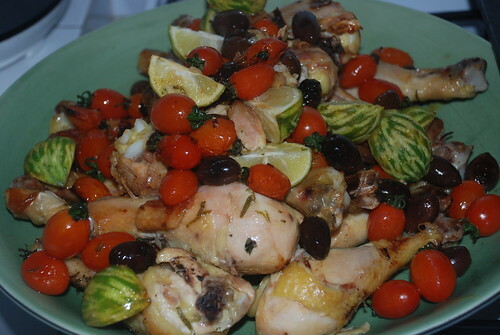 We served some cheese, bread, marinated mushrooms and wine to welcome everyone and for the dinner, we cooked Italian soup called minestrone, roasted chicken with with lemon zest, olives and tomatoes. 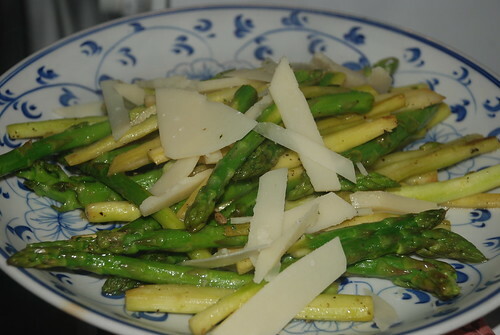 For the side dishes, we cooked roast potatoes, and made a beetroot salad and pan-fried asparagus with parmesan cheese. Thanks to my good friends for coming and making it such a great fun night. 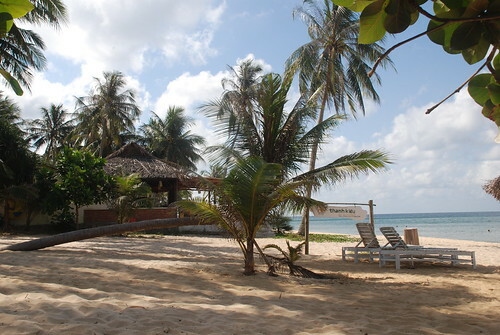 I am in Phu Quoc, the place to be!!! This is my second time here but I feel like I know this place very well. The people I met last time, from the hotel staff to the people who live around, are all still here. They are gorgeous with smiling faces and so sweet. We're staying at the Thanh Kieu Resort, the same place I stayed last time. I was lucky enough to get a room here as I booked way in advance as I heard some people couldn't get a room or had to pay lots of money for due to Tet holiday. 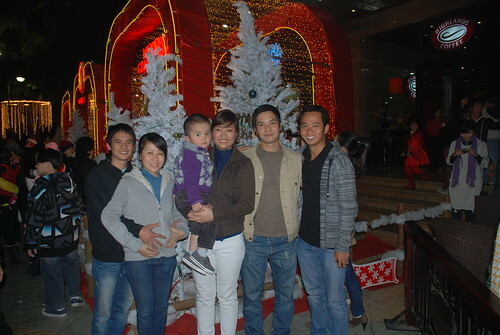 This is the first time I am not going home for Tet. I just want to do something different as I've been home every year for the last 8 years. I also want to spend sometime here to relax and enjoy myself. I do love my city but I went home last month to visit my family and my mother seemed happy with my decision. 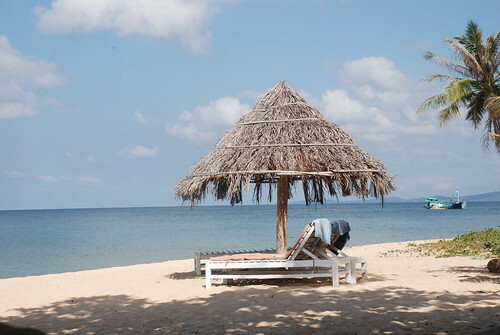 The weather in Phu Quoc is so beautiful compared to the freezing cold in Hanoi and it makes me feel so great. 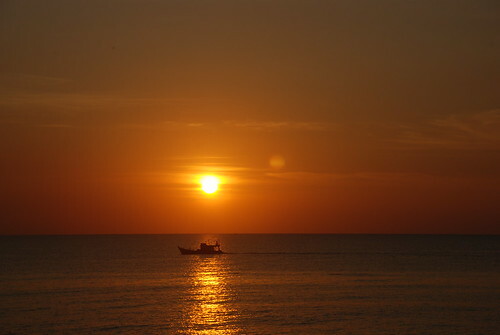 I am going to go to the beach to relax for the first few days and read a bit then off to the city for dinner at the night market which has the best food in town and REALLY CHEAP!!!! They're cooking fresh seafood in the Phu Quoc style which is a bit different compared to other cities in Vietnam. I will eat all of my favorites, especially stir fried crab with tamarind sauce. My mouth is watering now just thinking about it!!! Happy Tet every one and see you in the next few posts. 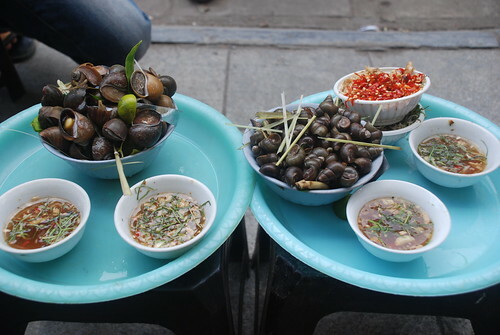 I was walking through the old quarter yesterday and saw so many young people sitting along Dinh Liet street eating snails. I have to say that snails have never been on my list of must eat things as I had trouble a few years ago when I ate some snails at the Old Man restaurant in To Ngoc Van street in West Lake. I had a stomach upset for 3 days in the row after eating snails on that occasion. I told myself that I shouldn't look but I actually did look and wanted to try them again. I ordered two bowls of two different kinds and also asked the waitress to give me lots of ginger and chiili. 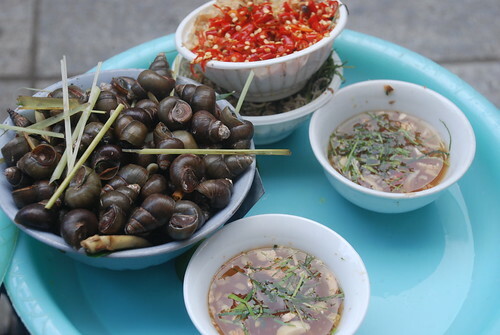 These snails don't actually have any special flavors at all but the dipping sauce which includes fish sauce, ginger, chilli and lemon is what makes the dish special. While I was sitting there trying to finish the two bowls I occupied myself by watching people walk past and by taking photos of this dish. 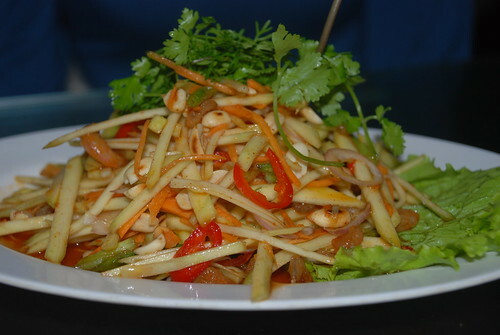 I hoped that eating lots of ginger and chilli would help to protect my stomach. By now, after 24 hours, I am still ok and I wouldn't mind going back again. If you have lots of time to spend, this is such a good place as it's cheap and a great location.